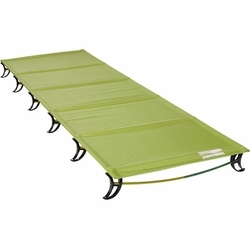 Therm-a-Rest LuxuryLite UltraLite Cot. As light as 2 lbs., the award-winning UltraLite Cot is lighter and packs smaller than any other cot on the market. Now redesigned to include ThermaCapture to help retain your body’s radiant heat, we’ve also revamped the feet and upgraded the carry-bag to make the UltraLite even more compact. So whether you’re fishing, backpacking, kayaking, or riding a motorcycle across the country, this is the cot you need for superior off-the-ground comfort. Ultra Lightweight: Lightest outdoor cot on the market. Super Packable: Compact design fits easily in the included carry-bag. Durable Construction: Stands up to heavy use. Customizable: Standard and lightweight setup options. 3-Minute Setup: Fast and easy assembly – no tools required.